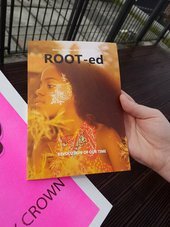 ROOT-ed Zine (Revolution of Our Time) is a self-published magazine and social platform that aims to promote, inspire and support creatives of colour who or from or currently based within the North West of England. The zine is run by artists Amber Akaunu and Fauziya Johnson who met whilst in their final year of university. The two noticed a lack of representation and opportunity for creatives of colour and created the platform to represent the underrepresented by allowing creatives of colour to showcase their talents and skills. Focusing on the theme of Hair; join ROOT-ed to discuss Ellen Gallagher’s DeLuxe 2004-5, an artwork made up of sixty individually-framed prints that feature advertisements drawn from magazines dating from the 1930s to the 1970s aimed at African American consumers. Following this, drop in and take part in a zine making workshop, looking at the methods, techniques and the unique topic of hair as featured in the collages that make up DeLuxe. ROOT-ed Zine and multidisciplinary artist and director Kiara Mohamed present their collaborative film Black Flowers 2018. The film is set in Liverpool’s Town Hall, a space built from the success of the slave trade and a space for meetings between slave masters. Black Flowers explores how Black artists can intervene, create and decolonise historically white spaces. Also featuring a series of photographs produced by Fauziya Johnson. Join ROOT-ed Zine, Kiara Mohamed, Councillor Anna Rothery, Mayoral Lead for Equality and Race Equality Liverpool and others to discuss and dissect the issues raised in the film. Kiara Mohamed will recite her poem Young Goddess 2018 followed by a talk on her practise and the issue of being a modern Black woman. Brown Sugar 2018 is a performance piece created by Khadija Amaru. The piece uses movement, film and spoken word to create a ritualistic atmosphere that explores the significance of sugar in regard to the transatlantic slave trade. Letters to my Sisters 2018 is a performance piece inviting people to open handwritten wax sealed letters and read them out loud or privately to themselves. The letters will be words of encouragement, love and healing, written by Kiara Mohamed, Amber Akaunu and Fauziya Johnson, with the aim to hope that in the process of reading the letters, it will resonate within the women. This journey of writing the letters to the readings and conversations generated in Tate Exchange will be filmed. ROOT-ed Zine's Co-Founder, Amber Akaunu’s work titled 39 2017-18 is a body of work that consists of 39 videos, each an artistic response to a Hip-Hop lyric. Akaunu uses this method to create artworks that are light hearted and fun yet also deal with serious and current issues such as racism, toxic masculinity and Eurocentric beauty standards. Akaunu would like to invite the public to share their favourite Hip Hop song and create a creative response to a lyric. Issue 4 of ROOT-ed zine is available to buy in the bookshop at Tate Liverpool.